Moving to a new home ranks as one of life's more stressful events -- even for our aquatic friends. Although many common pond fish, such as koi and goldfish, will eat out of your hand, when its time to transfer them, they may resist being handled and have difficulty adapting to a new environment. However, with good planning and attention to detail on moving day, you can take your fishy friends with you to your new pond. You can move your pond fish, if you plan carefully. Stop feeding the fish three or four days before the move. This helps keep digestive waste from polluting the transport water and reducing its oxygen. Double bag the plastic bags for added strength. Each large fish needs its own bag, while groups of small fish, two to three inches long, can share a bag. The fish need enough room to move around a bit. Collect enough pond water to fill each bag 25 percent full. Catching the fish will stir up sediment and foul the water, so collect enough water before netting the fish. Net the fish one at a time and transfer each to a bag. Fasten each bag twice, leaving plenty of air inside. Place the bags in a styrofoam cooler and shut the lid. The fish can remain there for 24 to 48 hours. Open the cooler lid slightly upon arrival at the new pond, to let the fish begin to adjust to the change in light. Wait about 10 minutes and open the lid further. Wait another 10 minutes then remove the lid. Float two or three bags on the surface of the new pond for about five minutes, or until the water in the bag has reached the temperature of the pond. Open the bags that have reached the desired temperature and allow the fish to swim out into their new pond. Repeat this process until all the fish have been released. Time the move for cooler weather, if possible, or net the fish in the coolest parts of the day -- early morning or evening. This is especially important for koi. 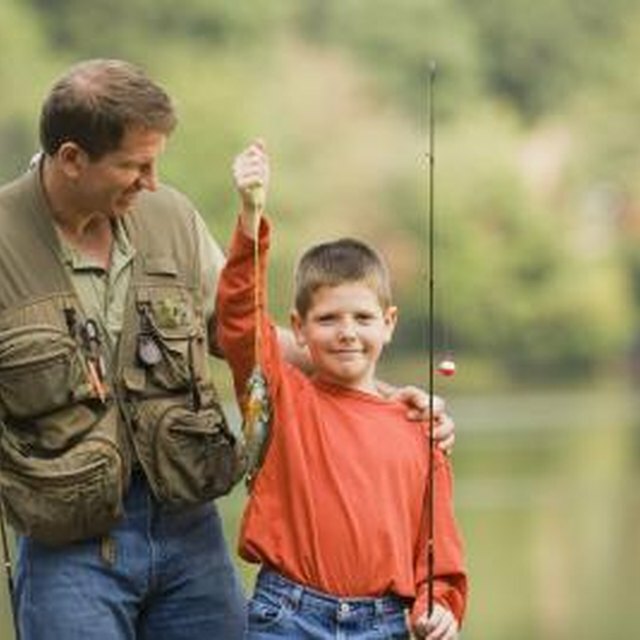 Fish are easier to catch when it is cooler because they are sluggish, their metabolisms slow and they use less oxygen. Once the fish are in the styrofoam containers, protect the coolers from heat, sunlight and excessive jostling. Do not open the lid to repeatedly check on the fish. Once they are inside the cooler, their environment will be dark; the fish should not be exposed to bright light. Release only two to three fish at a time, to keep them from becoming stressed. Test the water quality of the new pond regularly and watch the fish for signs of stress or injury. Lost scales, bumps and scratches need treatment to avoid ulcers and other problems. Avoid chasing the fish in the pond. When stressed, fish use more oxygen and recover slowly. Annette Strauch has been a writer for more than 30 years. She has been a radio news journalist and announcer, movie reviewer for Family Movie Reviews Online, chiropractic assistant and medical writer. Strauch holds a Master of Arts in speech/broadcast journalism from Bob Jones University, where she also served on the faculty of the radio/TV department.